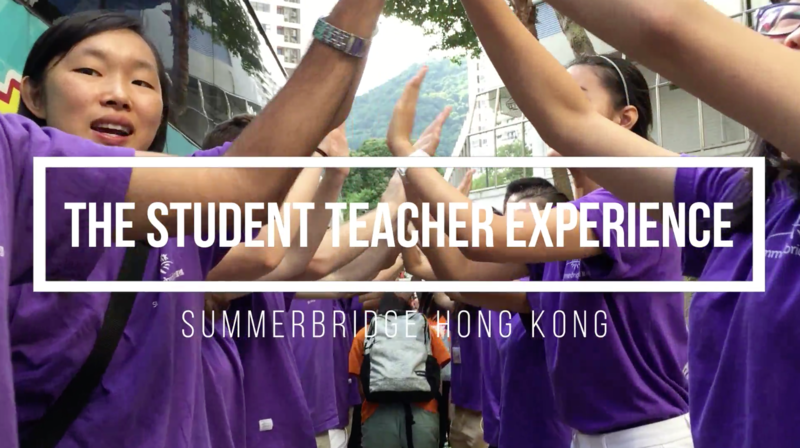 WHAT IS IT LIKE TO TEACH AT SUMMERBRIDGE? Student teachers experience the entire process of teaching: curriculum design, teaching, and assessment. Before meeting the students, student teachers participate in workshops and learn topics like lesson planning, English Language Development, and classroom management. Ongoing support and guidance is provided throughout the summer, to help student teachers become the best teachers they can be. Summerbridge students come from socioeconomic backgrounds where academic enrichment programs are not accessible or affordable. By becoming role models to those students, student teachers make a positive contribution and have a long-lasting impact on the local community. Many student teachers find this a rewarding experience, one that helps them realize the incredible change they can effect on society. Every student teacher plays a leadership role. Whether it’s teaching students in a classroom or collaborating with other student teachers to plan events, student teachers learn and experience the organizational and communication skills that help them become leaders not just in the educational context, but also in their future studies and careers. The majority of the Summer Program is planned, administered, and executed by our student teachers. Not only do student teachers choose their subjects and teach their own classes, they also plan and facilitate large-scale activities for students. What students experience is greatly shaped by the passion of our student teachers, who inspire students to widen their eyes to countless possibilities. Summerbridge student teachers are a diverse group. They come from different cultures and backgrounds, and compose a mosaic unique to each summer. Student teachers work together in an inclusive environment, experience cross-cultural interactions, and build friendships that last a lifetime. When the buses arrive, student teachers greet the students enthusiastically to motivate them for the day ahead! Every day at Summerbridge begins with an All School Meeting (ASM). During this time, student teachers support students to shine and perform in front of the whole school. Everyone learns a “Word of the Day” (a new English vocabulary word), participates in team-building activities, and gets excited for the coming day. Students attend four academic periods each day. Student teachers teach two periods and have free periods during the other two. During free periods, student teachers might plan lessons, meet with other student teachers to plan a special event for students, or observe another class to pick up useful teaching techniques. Student teachers eat with students and get to know them better outside of the classroom. A Family is a group of eight to ten students from different classes and two teachers. Families engage in activities and work together on different projects. Student teachers, in pairs or small groups, facilitate a sport or elective period. These are non-academic classes where student teachers have the opportunity to further share their interests with students. Some examples include yoga, basketball, origami, singing, dance, badminton, and French. Each day at Summerbridge also ends with an ASM. It is similar to morning ASM, but everyone also takes time to say thank you to fellow students and student teachers. Student teachers walk students to the bus and send them off with cheers. Student teachers make announcements, schedule meetings, and reflect on the day. Student teachers meet to discuss classroom related matters or plan events happening later in the week.